“I Love You” is one of the most powerful mantras. Open your heart to be a vessel to receive Da Tao Love. Receive blessings for every aspect of your life. Open your heart to be a vessel to give Da Tao Love. 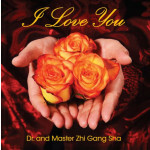 Sing this mantra with Master Sha. Sing to all humanity and all universes. Be Da Tao Love. Melt all blockages. Transform all life.